The number of channels you got in your area is determined by what's being broadcast in your area. Channel reception will vary depending on how far away you are from broadcast towers, and your surroundings. Check out what channels are available in your area and how many channels you've got. If your TV picture is not crystal clear, or you can not get the weak signals from far away towers, you can use this amplifier to boost the weakened signals. We do NOT recommend to use this amplifier/booster if your house is very close to the broadcast tower and the signal is already very strong. A booster will cause self-oscillate and you may get fewer signals than without. Power Supply: DC 6V 100mA by external adapter or DC 5V from USB source. This amplifier is a perfect accessory to boost signal for your passive antennas. 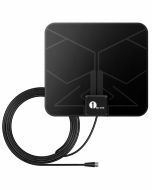 Boost Any Non-amplified TV Antenna up to 15 Miles Range. 1byone 12 months Warranty assures you of its superior build quality. Note: Get 1byone tv antenna amplifier for better reception. will this amplifier work with a Leaf ultimate indoor antenna? For the amplifier to work does it need to be connected to the antenna and then into a usb port? The amplifier connects to the antenna and plugs into an electrical outlet or plugs into the USB port on your TV for power. Live in sf approx. 2 miles from sutro tower. can't pick up ch.5 or ch. 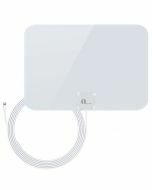 7 with the 1by1 flat antenna. will this allow me to receive them? can you use a 12V 100mA in the place of a 12V 50mA for the lava antenna 8008? to replace the 6V/5V 100 mA.